In networking, routing usually depends on destination IP addresses (default, routing protocol or static route). PBR allows to route traffic according to any element (source address, ToS, protocol, port, …). The most common reason to implement Policy Routing is a need for source routing and will documented here, using Linux advanced routing capabilities, Cisco IOS and FreeBSD. Warning! PBR can cause severe damages on your network, such as bringing it down or overloading your routers. I will not be responsible if you are trying to implement Policy Routing on a live network; you’ll have to assume the risks. Always make sure you can connect to the console of your equipment to reverse your changes in case of failure. At work, I had to route some traffic from a server to different satellite transponders according to the source IP address involved, thus I implemented PBR on the Linux server in order to route traffic to the correct satellite modulator. This option saved two NNTP servers and the design of any mechanism of data synchronization between them (news feed). Additional complexity due to failover and specific needs has been removed from this example. First of all, to understand the used commands, we have to define an IP address on every interface used. This server needs to talk to clients over satellite and will communicate with its feeders over the LAN. 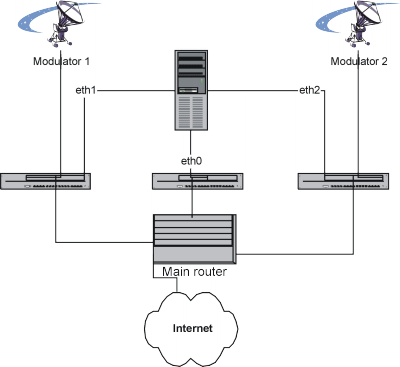 The default routing goes to the main router on the interface eth0. In addition, traffic sent from the interface eth1 (192.168.1.3) will be sent to Modulator 1 (192.168.1.2) and the traffic transmitted from the interface eth2 (192.168.2.3) will be sent to Modulator 2 (192.168.2.2). These rules don’t depend on the destination IP address! This allows to different gateways for each network interface of the system. Notions of from and to might be ambigious, but will refer according to the server, not the clients connecting to it. In order to setup policy routing, you need a Linux kernel running with advanced routing capabilities and policy routing enabled. You might also have to install the package iproute2 that you can find at here. Debian users can try the command apt-get install iproute. Knowledge in networking will be helpful too. During my tests, the traceroute command bypassed the PBR rules. Also, my iproute2 has some problems showing the rules and routes; that forced me to remember the rules I entered when I wanted to remove them. I did not test recently if these “problems” have been fixed. Also, iproute2 can be used for many things, such as QoS. A Cisco router can be used to implement PBR, using route maps applied on the involved network interface(s). Implementing Policy Routing on a Cisco router will have some secondary effects on the device, such as a higher CPU load. It can also conflict with route caching which ought to be disabled. Last but not least, it can cause headaches, especially in an environment using a routing protocol. Be careful! The network design is a bit different from the Linux example. The different addresses will be on the same IP network (192.168.0.2, 192.168.0.3 and 194.168.0.4/24) and will be connected to the Interface FastEthernet 0/0 on the router. The router is still connected to the 3 different subnets where the modulators are. Now we have to define a route-map that we will define the routing to the satellite gateways. To avoid unnecessary confusion, the used numbers are the same as in the access-lists. First, we need to define a rule described by any traffic coming to the LAN on the router should be sent on the Interface FastEthernet 0/0. Now the PBR is active; if your router stopped responding, something’s wrong and you’ll have to review your setup. With FreeBSD, ipfw can be used to manage policy routing if the option PFIREWALL_FORWARD is enabled in the kernel. The command syntax is ipfw add fwd address rule where rule has the same syntax as a filtering rule. It will send all outbound mail packets via router 192.168.1.2 irrespective of the routing table. Policy Routing in Linux, an article in SysAdmin mag. Policy Routing Book by Matthew G. Marsh.